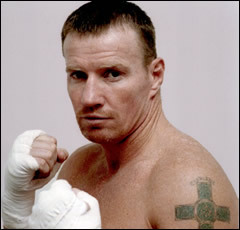 Irish Forums Message Discussion :: Irish Micky Ward. The Fighter Oscar winner. Irish Forums :: The Irish Message Forums- Irish Films- Irish Micky Ward. The Fighter Oscar winner. Irish Films Discussion: Irish Micky Ward. The Fighter Oscar winner. Irish Micky Ward was one great fighter. Irish warrior spirit. The Fighter based on Irish Micky Ward is one hell of a movie. Go Irish at the Oscars. Winner: Melissa Leo for "The Fighter." Winner: Christian Bale for "The Fighter." The Warrior's Code by Dropkick Murphys, was written in respect of Irish Micky Ward. Micky Ward (Mark Wahlberg) is an Irish-American welterweight boxer from a working class family in Lowell, Massachusetts. Managed by his mother, Alice Ward (Melissa Leo), and trained by his older half-brother, Dicky Eklund (Christian Bale), Micky has not had a particularly successful career: He's become a "stepping stone" for other boxers to defeat on their way up. Complicating matters, Dicky, a former boxer whose peak of success was knocking Sugar Ray Leonard down in an HBO televised match, is unreliable and addicted to drugs. Dicky was known as "The Pride of Lowell", a fact he and his mother relive and boast about. Now an HBO documentary crew is filming Dicky's day-to-day affairs, which he tells people is about his comeback, but is really documenting his crack cocaine addiction. Alice chooses to overlook Dicky's drug addiction. On the night of an undercard fight in Atlantic City, Micky's scheduled opponent is ill, and a substitute is found who is 18 pounds heavier than Micky. Despite Micky's reservations, his mother and brother agree to the terms so that they can all get the purse. Micky is soundly defeated by the much heavier fighter in an obvious mismatch. Frustrated with his career and embarrassed by his defeat, Micky tries to retreat from the world and forms a relationship with Charlene Fleming (Amy Adams), a former college athlete who dropped out and became a bartender. After several weeks, Alice arranges another fight for Micky, who, concerned it will be turn out the same as before, shows serious hesitation. His mother and seven sisters blame Charlene for his lack of motivation. Micky mentions that he's received an offer to be paid to train in Las Vegas, but Dicky says he will match the offer so he can keep training and working with his family. Dicky then tries to get money by posing his girlfriend as a prostitute and then, once she picks up a client, impersonating a police officer to steal the client's car. This is quickly foiled by the actual police and Dicky is arrested after a chase and a fight with them. Micky intervenes to try to stop the police from beating his brother, but he is also beaten and a police officer breaks his hand before arresting him. At trial, Micky is released but Dicky is sent to jail. Micky denounces Dicky for the trouble he caused. On the night of the HBO documentary, Dicky's family, and Dicky himself in prison, are horrified to see it is High on Crack Street: Lost Lives in Lowell, a documentary about how crack addiction ruined Dicky's career and life. Devastated, Dicky begins training and trying to get his life together in prison. Micky is lured back into boxing by his father, who like many believes Alice and his stepson Dicky are bad influences. Gathering the other members of his training team and finding a new manager, Sal LoNano, they convince Micky to return to boxing with the explicit understanding that his mother and brother will no longer be involved. They place Micky in minor fights to help him regain his confidence. He is then offered another major fight against an undefeated up-and-coming boxer. During a prison visit, Dicky advises Micky on how best to work his opponent, but Micky feels his brother is being selfish and trying to restart his own failed career. During the actual match, Micky is nearly overwhelmed at the beginning but, remembering his brother's advice, alters his strategy and is eventually triumphant; he earns the title shot for which his opponent was being groomed. Upon his release from prison, Dicky is met by his mother and the two go to see Micky train. Assuming things are as they were, Dicky prepares to spar with his brother, but Micky informs him that he's no longer allowed per Micky's agreement with his current team. In the ensuing argument, in which Micky chastises both factions of his family, Charlene and his trainer leave in disgust. Dicky storms off, presumably to get high again, and Micky's mother chides Micky, only to be sobered when he tells her she's never been as good to him as she was to Dicky. Dicky returns to his crack house, where he says goodbye to his friends and heads to Charlene's apartment. He tells Charlene that Micky needs both of them and they need to work together. After bringing back everyone, the group goes to London for the title fight. Micky scores another upset victory and the welterweight title. The film jumps a few years ahead, with Dicky, as talkative as ever, crediting his brother as being the creator of his own success rather than taking co-credit as he had in his younger years. The Fighter is a 2010 biographical sports drama film directed by David O. Russell, and starring Mark Wahlberg, Christian Bale, and Amy Adams. The film centers on the life of professional boxer "Irish" Micky Ward (Wahlberg) and his older half-brother Dicky Eklund (Bale). Amy Adams co-stars as a love interest of Ward. 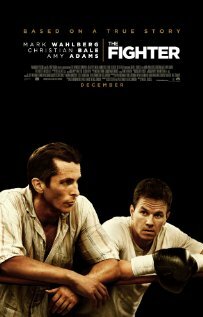 The Fighter is Russell and Wahlberg's third film collaboration, following Three Kings and I Heart Huckabees. The film was released in select North American theaters on December 17, 2010 and was released in the United Kingdom on February 4, 2011. It was nominated for seven Academy Awards including Best Picture and Best Director, winning the awards for Best Supporting Actor (Bale) and Best Supporting Actress (Melissa Leo).